Philo Taylor Farnsworth was an American inventor, best remembered for his contributions to the invention of the television. Farnsworth was born to a Mormon family in 1906 in his grandfather’s log cabin in the small town of Beaver, Utah. Farnsworth was a curious child with a thirst for knowledge. As a child he used to have long conversations with the repairman who came to his family’s farm to repair their generator. Soon, Farnsworth was able to fix the generator by himself. His favorite subject was the study of electricity and by the time he was in high school, he had converted many of the appliances in his family home to electric power. He also won $25 in a contest for designing a magnetic car lock. His father died when he was just 15 years of age, leaving him with the responsibility of caring for his mother and 4 younger siblings. In high school, he was an excellent student of Chemistry and Physics. The idea of transmitting electronic images in waves came to him when he saw tracks left in the mud while tilling a field and wondered how electricity could be transmitted in a similar way. He shared his idea with his high school teacher by making elaborate diagrams on the school chalk board. His teacher strongly encouraged him and is credited by Farnsworth as being one of the encouraging and guiding forces in his life. After leaving school, Philo Farnsworth enrolled at Brigham Young University but had to leave prematurely due to financial constraints. At university, his request for enrolling in advanced classes and special permission to use the lab was denied, so he signed up for a correspondence course with the National Radio Institute to earn a certification as an electrician and radiotrician. He also briefly enrolled in the U.S. Navy and held a series of odd jobs including door to door salesman and lumberjack. In 1926, he began to work on his idea to develop an electronic television in earnest. He persuaded some friends to back him financially and was able to develop a prototype by 1927, which he proceeded to demonstrate publicly. This demonstration was intriguing enough to attract more investors, and by 1930 he was able to patent the idea of an “all electric TV”. However, other scientists at the time were working on similar ideas including The Radio Corporation of America (RCA). They offered to purchase Farnsworth’s patent but he refused. This led to many patent battles which eventually ended up in Farnsworth’s favor when RCA was ordered by the court to pay $1 million in return for using his patented technology. 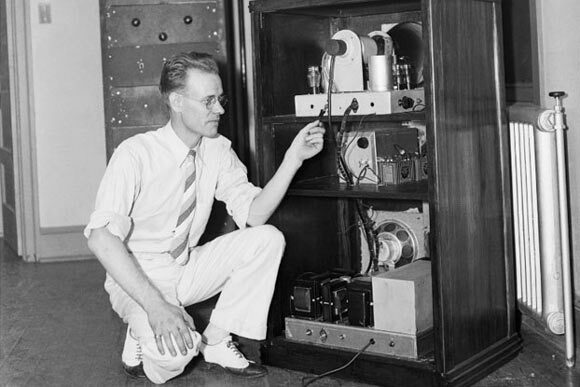 Other than inventing the first all electric television, Philo Farnsworth’s made several other contributions to science including the astronomical telescope, nuclear fusor, infrared night vision devices, the electron microscope and the baby incubator. He held a total of 300 U.S. and foreign patents in his life. Philo Farnsworth was married to Elma Fransworth (nee Gardener) whom he was devoted to and had four sons with. His wife was involved in his work as well and drew all the technical sketches for his research and patent work. Farnsworth idealized television as a medium of spreading positive information and knowledge to households across America and all over the world, and was disillusioned with the type of content being shown. He also battled with depression for a long time and turned to alcohol in his later years. He died at the age of 71 due to pneumonia. He has received a number of posthumous awards and accolades including induction into the Broadcast Pioneers of Philadelphia Hall of Fame in 2006.